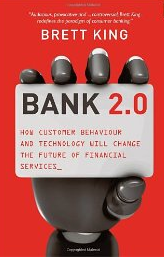 I just finished reading Bank 2.0 by Brett King. If I would work in middle-management of a bank – any bank – then I would be scared now, because the book clearly shows that banks are changing to slow. Or they simply deny that the world around them is evolving faster and faster and still try to continue business as it used to be. Banks still spend too much time trying to solve the wrong questions like how to design branches or think about channel distribution. What they need to understand is that a customized solution fitted to the needs the customer has right now is needed. If bank management does not foster innovations quickly they will lose contact to the customer. Banking function will continue but the interface to the customers might in future be held by p2p payment providers, p2p lending services, telcos, aggregators or other non-banking “insurgents”. The book is filled with ample examples and observations from the authors work experience in banking. Available at Amazon US, Amazon UK and Amazon DE.